I was astounded…surprised… It was a gift to me that morning. I saw this tiny flower … as I passed. It had stopped me in my tracks. I hastened slowly. Like a flower in the desert it bloomed on a barren brick wall. Moved by its unexpected beauty I returned to take a photo. To my greater surprise and delight, this young man chose to pose for me. It became for me a moment of grace. In some small way the flower was a precursor to a bigger experience. It opened me to the wonder of that encounter. The joy of the young man became my focus. He was quite unaware of the little flower and became the memorable gift. We cannot be prepared for the unexpected; for those moments of inspiration or insight which come to us as gift. No matter how much we may desire or seek after them, they are beyond our control … they are gift given freely. Something resounds deep in our spirit in these experiences. They remain with us as moments of being touched by the Other. Often they prompt us or reorient our gaze or thought. For people attuned in the arts this is the visitation of the creative spirit which imparts inspiration. In Roman and Greek mythology, The Charites or Three Graces are daughters of the Gods, known as benevolent spirits of giving and receiving – gracious in virtue, bestowing beauty, wisdom and creative inspiration. They were invoked particularly by artists, poets and musicians. At various times, we all experience moments of grace – bestowed on us as surprise from a source beyond us. The experience is often marked by a spiritual recognition that this was “out of the ordinary”. Often it is described as “suddenly” or mysteriously, and associated with an inner conviction of a truth or insight which is uniquely and personally significant. It may simply be a nuance or a word, but it resonates profoundly. In some particular way grace finds us in a place of relative darkness and brings to us new light. Grace is a light on our path to inspire us forward and leads us to new ways. Whether we suppress them, forget them or cherish them, we are touched. Writers, artists and people of many cultures and faiths make space to wait upon the Spirit and become graciously receptive. They receive the gift and become instruments of the flow of grace. Through contemplative spiritual direction individuals revisit such experiences and prayerfully discern their personal meaning. We grow slowly to recognize the spiritual presence and foster an ongoing relationship with the Creator Spirit. 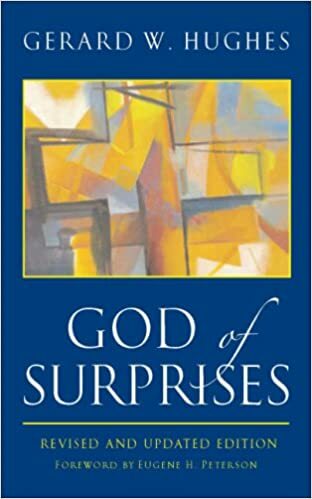 “The God of Surprises” Gerard Hughes.